First and foremost I must get something off my chest. Just because a box of something at the grocery store or even a bagel at the bakery says “multi-grain” does not mean it is a healthy alternative. Multi-grain simply means the food is made with more than one grain and has absolutely nothing to do with whether any of those grains are actually whole grains or not (which is what is really important). Once again this applies to all brown/colored rice whether it is quick cooking, parboiled, brown rice flour, etc. One of the reasons this one can be tricky is that a lot of products simply say “wheat” which means it has been refined. If you are after the whole-grain it must (and will) say something like whole-wheat or whole-grain wheat if it truly is the whole grain. One last important note on the subject of grains….I love the Whole Grains Council. You may have heard of them or at least recognize their stamp (pictured) on some packaged foods. They are what I consider to be the experts when it comes to understanding grains. I call them frequently, and they are always so friendly and knowledgeable when answering my questions. 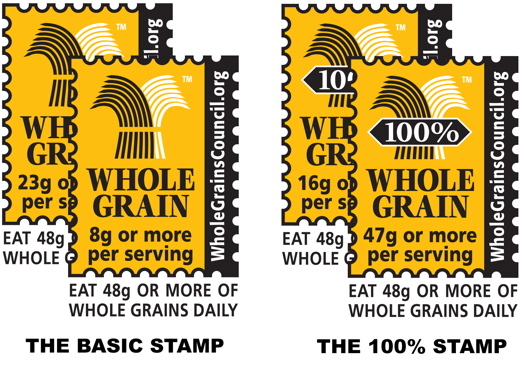 I have one tip though when it comes to looking for the Whole Grains stamp… there is both a basic stamp and a 100% stamp. The basic stamp tells you how many grams of whole grains per serving are contained in that product (and usually indicates the prod uct also contains some refined grains). The 100% stamp means the product contains only 100% whole grains and therefore contains no refined grains at all. So the next time you are shopping at the supermarket, don’t be misled by some of the “whole-grains” health claims on the front of the package. Instead, do a little investigating yourself to ensure you are buying products that contain 100% whole grains (although consuming any amount of whole grains would certainly be better than none!). Great breakdown, very easy to remember! Hi Lisa! Thank you for such a great post. I’m sharing it on my blog, Medium Food Mama. I read your blog often and feel a connection to you and your mission. Mine is similar, although I weave in much more convenience items than you do! I also noticed we both did spots on Larabars and are fans of Great Harvest bread. Great minds think alike? Keep up the great work, it’s truly appreciated. I love meeting others who are on a similar mission…the more the merrier! Great post! This year I started trying to cut out processed sugars & flours and I was definitely surprised by how many things SEEM to be whole grain but are not! I had all the wheat related stuff down but the part about the corn was definitely helpful. Thanks! Wow – thanks so much for the simplifying this!! I’ve never in a million years thought to call the Whole Grains Council. What have you called/learned about? Pretty much everything in this post with the exception of the wheat section…they know everything when it comes to grains! That’s really interesting, especially about corn. I never knew that corn actually was healthy. I thought it was just kind of a waste food – all starch. Whenever I saw “whole grain corn” I just thought it was bogus. Good info to know! Also never took a close look at the whole grains stamp. Thanks for all the info! Problem… I HATE whole wheat bread taste… I know, I know!! I’ve tried buying different brands, but still hate it when I get home and have to eat it, I end up not eating it and it goes to waste. What I have done, is tried to find a white bread that has the most fiber and it usually tends to be one of the “12 grain breads,” am I just fooling myself? Or is this at least a little better than the typical white bread? But also, thank you for breaking it down, after reading this, it’s not so hard to decipher at the grocery store. I used to absolutely HATE anything whole-wheat as well. I would have rather starved than had whole-wheat bread. The problem was that I had only tried whole-wheat breads from the grocery store. Once I bought my first loaf of freshly baked (5 ingredient) bread from a local bakery I actually thought it was pretty good and got even more used to it over time! They also put a little honey in it which helps. When I am making stuff at home I use a flour called white whole-wheat which is a little lighter variety of whole-wheat and makes the transition easier. Wonderful blog! I would also recommend you look into other relatively esoteric grains for your 100 day mission such as quinoa, millet, buckwheat, and barley (although technically, some of these are considered seeds :) Due to the mass production of wheat, some nutritionists believe many people are mildly intolerant to the grain yet, unfortunately, do not realize. I actually bought some quinoa and have been meaning to use it…thanks for the reminder! Thanks for that info, very interesting. I get bored of plain rice but I’m not very good in the kitchen. There’s tonnes of easy ideas at this rice recipes homepage I found that your readers might be interested in too. Your blog has been a much needed boost to my moral in searching for a better way of eating and living. I have to pick your brain and see what you think about diets based on blood types and gluten free foods? I’ve recently tried to adjust my diet to suit my blood type’s needs and am trying to stay on a real foods track. Any suggestions for gluten free real food alternatives? Hi there – I really haven’t done any research on how blood type relates to diet. If you are interested in eating gluten free you should check out The Fresh 20 (our sponsor) http://www.thefresh20.com/ because they have gluten-free meal plans or Deliciously Organic http://deliciouslyorganic.net/ because they also offer a lot of gluten-free recipes. I hope that helps! This post is SUPER helpful to me. The wheat I’ve understood, but the rice was confusing to me. I’ve passed up “Brown rice” products because they didn’t say “whole brown rice” – now I know they’re acceptable! FYI you can indeed find whole grain corn flour. Companies like bobs red mill offer lots of choices for whole grain products in various grinds. All corn flour is is a finer grind. I love using it for pancakes and I add it to my bread dough sometimes. They also have some barley flour that I love. One last word about bobs red mill. I really like supporting them as they are still an independent company. In fact they are employee owned! Unlike arrowhead mills which is owned by a big food company Hain. This is awesome! FINALLY a breakdown of what is a whole grain and what isn’t! I have some other flours that I’ve wondered about, but haven’t gotten to the bottom of: Graham flour, Gram flour (I’m pretty sure these are different flours), Semolina flour and Buckwheat flour. Any clue about these? I see that the 1st ingredient in baking powder is corn starch, but I see that you use baking powder at times. How do we get around that, or is it not so bad? Yes, it bugs me and I’ve tried to find baking powder without cornstarch, but I was unsuccessful. Luckily we use such a SMALL amount so we had to let it slide. Corn starch is highly refined so we try to avoid it! Is “unbleached enriched whole wheat flour” ok? Pita bread ingredients: Unbleached enriched whole wheat flour, filtered water, salt , yeast, calcium propionate??? The problem I have is I have a wheat sensitivity and can not have anything with “regular” flour. This is a struggle. I have not ventured into experimenting with the other flours that are safe for my digestion. My 7 year old and I also have a problem with milk. He has always only drank water or milk. I can not begin to explain how stressful this lifestyle is as I know yours is not easy, but mine is even more difficult with limited food resources. What do you think about this?? I wonder where it leaves me with options on wheat and brown based flours/rice etc.. vs white. Hi there! I would recommend you do some further research like reading In Defense of Food by Michael Pollan. That’s where I initially got my understanding on why whole grain is best. Hopefully it can shed some more light on the topic for you. Also he has addressed white rice specifically in some online articles. Unfortunately rice is not the only difference in the Asian diet vs. the Western diet (therefore not the only reason for the difference in health). I know when I personally cut out refined grains and sugar my blood test results improved dramatically (specifically my “good” cholesterol number). This is really informative. Thanks for sharing. Thanks for this web site. You are doing a great job and helping lots of people! Have you read Wheat Belly? I normally eat pretty much like you prescribe here, but after reading this book, completely cut any kind of wheat out of my diet. Results were amazing. Immediately lost 10 lbs. (1 week), gained mental clarity, AND lost inflammation issues. Sore joints, gone. Even more importantly, I don’t have the big blood sugar swings causing me to crave sweets any more! This is huge! Wheat, even 100% whole wheat, has a higher glycemic index than almost anything – even sugar! I am loving your blog! I too am wondering about this Wheat Belly book only not for the same reasons! I have GI issues and I feel the best when I make sure to get in my whole wheat for the day. My sister-in-law however feels better when she cuts out wheat. We just figure our bodies need different things. But, then this book came out and (it seams like) everyone I work with thinks I should cut out whole-wheat! They are saying all wheat even whole wheat, even organic has been genetically altered and is not what it used to be. I would love for this claim to be wrong! What are your thoughts on the idea of cutting out all whole wheat? My understanding after reading Wheat Belly is that modern wheat is so hybridized and far from what we ate historically, that it is disruptive to our bodies… particularly our pH level which should be alkaline. I feel way more energetic without wheat. I like the blog too, but with regard to corn, I think we should stick with non-GMO whenever possible!!! What do you use in place of corn starch? I have been told that whole wheat flour sitting on the shelf is just as bad for you as white flour and that to actually have whole wheat flour it must be freshly ground and used within a day or two. I also read that it loses most of its vitamins after so many hours after being ground. What are your thoughts on that? I’m really hoping that’s not the case because I’ve starting baking with whole wheat and don’t want to have to grind my own. Also do you think organic is of utmost importance for whole wheat? It is harder for me to find. Thanks so much for all your great tips and recipes! I’m loving your blog! Do you have a recipe for Real Food Friendly bread using a bread machine, or have one that you can recommend?? Thanks! starchy, it is still better than brown rice if you choose to eat any rice at all. Brown rice is just a rice that still has a hull on it, but the hulls of grains are used as protection for the grain to be able to make it through the digestive tract of animals, i.e. it is not meant to be digested well. As we know, being able to digest our food is critical in being able to get nutrients out. I’ve been on organic brown rice for as long as I can remember b/c I always thought white rice was so refined. What to do now??? This is a great question maragret, i wonder why it never received a response from 100 Days??? Finally a website that breaks it all down for us in one place !! I love this Blog!! I have been using King Arthur Whole Wheat flour for a long time and have been under the impression that it is indeed “whole-grain.” Looking at the bag just now, it does say 100% whole wheat on the front but it has only the basic Whole Grains Council stamp (not the 100%). Can you shed any light on this for me? Thanks so much! Just a quick clarifying question. Triscuits list “whole grain white wheat” as an ingredient. That qualifies as a whole grain, unrefined right? I’m just starting out (slowly) and am trying to clean up my kitchen. Thanks! I understand what you are saying, but triscuits are not a whole grain, they are a processed cracker. Whole wheat flour is not a whole grain, it is a ground down, processed flour. I think of whole grains as quinoa, millet, brown rice, even polenta. Wheat Belly is a great read about processing and the history of wheat in all its forms. Actually, eating no grains is better than eating any. There’s absolutely nothing that you NEED from your diet that you can only get in grain and nowhere else. I hear people criticizing no-grain eaters by saying “where will you get your fiber?” but wow, did they not understand there is fiber in veggies? I especially need to be off wheat; come to find out that between it and my caffeine intake, both were aggravating my migraines. It was to the point I was starting to see auras regularly and I hadn’t done that for most of the years I’ve had these headaches. By the time I finally quit it I was itching at night when I was trying to go to sleep, suffering frequent bouts of insomnia and occasional bouts of what appeared to be mild mania (hypomania? ), and plagued with regular bouts of various GI problems, from reflux on down. But it’s not just the wheat or the gluten. I’m learning that too much starch messes me up, *period*, and I’m better off not eating it. Doesn’t matter if it’s rice or corn or what. For a foodstuff that’s supposed to be healthy, that is really weird, and plainly it is not just the gluten bothering me. I don’t mean to make my experience representative of everyone’s health and even when someone *is* gluten-sensitive, they might not have the same symptoms as me, and some gluten-sensitives have no obvious symptoms at all. But it seems to me that if a food is truly healthy, short of having a true allergy to the food, everyone should be able to eat that food without negative consequences. And there *are* foods like that… but none of them fall under the grain category. Or sugar either. What is your take on other grains such as Kamut, Farro, CousCous, or Mille?. I’ve been confused by these ones. I buy the plain organic puffed cereal (usually the rice and corn) for my toddler to snack on, and I’ve used a bag of Farro in place of rice. They say they are 100% whole, but I’m still a little confused. Actually, couscous isn’t a grain, it is a type of pasta. I was trying to eat healthier for years buying whole wheat products – bread , pasta, crackers, etc. When we went wheat free my husbands bloating after eating went away and my inflamed bladder went back to normal. It has made a huge difference for us . We now eat occasional wheat containing products but never whole wheat. I bake with almond meal and coconut flour now. Is long-grain rice okay? What about wild rice? Can you tell me about Semolina flour? We have a pasta shop locally that only uses durum semolina. I am trying to figure out if it “qualifies” based on the real food rules. My teenage son takes a sub/hoagie for lunch everyday. Any ideas on where I can find whole grain sub roll? Making my own is not an option. Thanks so much. For more in depth information of whole grains, check out chefbrad.com. He is the grain guru of our time in my estimation. You can watch his cooking show online too. What can I use as a substitute for cornstarch. My husbands favorite dinner includes cornstarch as a thickening agent. I want to try this but got so sick from the granola, nuts and seeds. I was reminded that I most likely have IBS and can’t eat those or any corn or whole wheat. What do I do? I want to cute our processed foods, but these items make me sick. Hi Karen. I think it is a matter of figuring out what whole, unprocessed foods will work for you and adding them in where you can. If you haven’t talked to a doctor, I would. If you would like to go a less traditional route, consider seeing a naturopath. They often take an approach based on nutrition. These articles might be helpful: http://www.joybauer.com/ibs.aspx and http://www.besthealthmag.ca/eat-well/digestion/9-tips-for-eating-when-you-have-irritable-bowel-syndrome. Was at a chain bakery (Sunflower Bread Company) that listed “high gluten flour” first in all their products. Some products went on to list whole grains, nuts, and seeds (their 9 grain bread for example) – others listed enriched white four (white bread). When listed as an ingredient, is high gluten flour always white/processed flour? In regards to corn being considered a whole grain, it needs to be kept in mind that the niacin in corn cannot be digested as is. Native Americans always soaked corn in a limewater solution which released the niacin. Hi… Is stone ground corn a whole grain or refined grain? I am trying how to do real food with a daughter that has to be gluten and lactose free. Is her pasta I use considered whole food? It has brown rice, rice bran and water. Is there a guide somewhere with gluten free flours? I make her own bread most of the time, but usually it has potato starch or tapioca flour in it. Thanks for any advice or links that could help me figure out how to do this. This is a good question. I have only one GF bread recipe without starch, but it cannot be made without xanthan gum. When baking with flour, what should be used to keep it “real”? And how would you adjust that in recipes calling for all purpose flour. I have tried substitutions before and can’t seem to get it right! Thank you! On our last few transitions to “real food”! What about the pasta question? Is pasta a whole food? In particular, I would like to know your take on orzo. Thanks. Hi Sidney. Just be certain you are using 100% whole grain pastas such as:http://www.delallo.com/products/organic-whole-wheat-orzo. Is the King Arthur unbleached all purpose flour ok for unprocessed? Hi Jenn. We use 100% whole grain flours. I have been making your whole wheat bread recipe for some time in my bread machine. I went into our local bakery just to see what they offered. Can you please tell me exactly what bread flour is and if it is ok for “real foods”? We started real foods oct 1st and love it but I’m still learning. Thank you for all your help and recipes! Hello Jenn. Bread flour is a high protein high gluten flour but is not whole grains. Aim for 100% whole grain, if possible. thank you for your explanation on cornmeal begin refined and why. makes a lot of sense. I am doing a diet with no gluten and no refined foods. I am i doing great with no flour and eating brown rice and potatoes and lots of vegetables and other organic stuff. The only problem is that i was consuming cornmeal and that was because i didnt know cornmeal was a refined product. But now i know :D thanks alot. Hi. Yes, it should be. It is just a finer grind. Thank you. Learned a lot here!! !